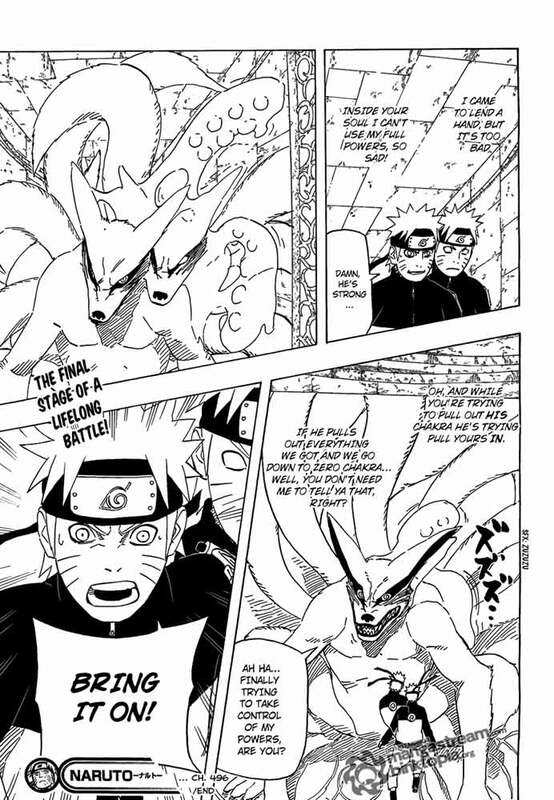 Naruto Manga Chapter 496 Meeting the Nine-tails Once Again is already out. Naruto and Killer Bee come to the temple behind the fall. Scared place for train to learn how to control nine tailed beast. Before Naruto meet with his beast, Killer Bee take him to someplace where only pure-hearted can go in. In the test to entering that place Naruto make some joke to Captain Yamato, lol. And finally Naruto and Killer Bee go inside Naruto's mind to talk with Nine tailed beast. Naruto removed the seal and the nine tails break free. Naruto has to pull out nine tailed chakra from his body before the opposite happened. So this is the final stage of a lifelong battle.